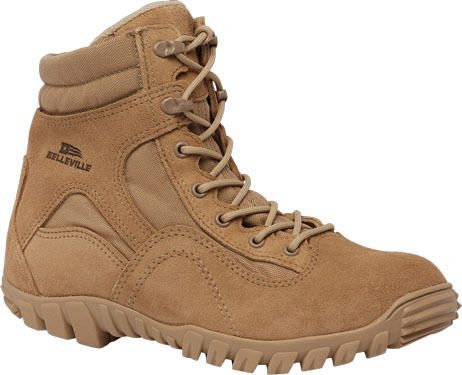 The Belleville 763 Men's 6in Desert Tan Waterproof Assault Boot was designed for tactical professionals situated in mountainous settings. 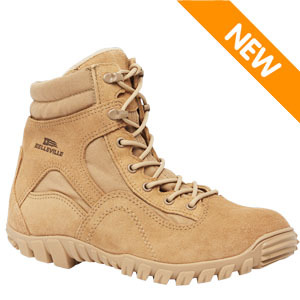 The 6 inch height provides ankle support and keeps you cooler in hot weather compared to a full 8 inch boot. A high quality 100% cowhide leather and ballistic nylon upper keeps this boot lightweight while providing excellent durability. An aggressive Vibram Ibex outsole aids in navigating up and down rocky mountains with loose terrain. For additional capability, a serrated toe bumper aids in vertical climbing & crawling. This boot is proudly made in the USA.